A respectable January is in store to open the decade's second half, with genre pictures of both high and low pedigree battling it out for supremacy with an army of December holdovers. Two of those 2014 films could dominate the month and give Liam Neeson and Kevin Hart a run for their money. As has been the case in many past years, Oscar-bound holdovers from the previous month should rule the January box office, and Selma is the most intriguing contender. Entering the awards season with almost unmatched critical acclaim and a three-digit Rotten Tomatoes score, as well as buzz about its up-and-coming director and stars, Selma has a blueprint title to follow (Lee Daniels' The Butler, which cleared $100 million and also co-starred Oprah Winfrey, who ought to give Selma a lot of notice). The release strategy is pretty clever: a strong bow at under 1,000 theaters on January 9th, followed by a saturated roll-out on Martin Luther King Jr. weekend, where the movie should be really be huge. 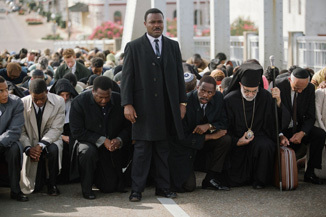 Yes, Selma doesn't look as unabashedly sentimental and crowd-pleasing as The Butler, but its fundamentals seem equally strong.